Become A Professional Taxi Driver! Learn about United Checker Cab. For reliable Torrance taxi service, United Checker Cab is the company to call! We provide professional service with fast pickup and courteous, knowledgeable drivers who will get you to your destination safely and on time. Best of all, with our user-friendly Curb app, you can get cab service at any time with just a click. Simply download the app and you will be on your way to convenient cab service that works on your schedule. This San Pedro taxi company has been serving the needs of our customers throughout the area for years. Our Carson taxi drivers are professionally certified, with proper licensing and insurance coverage to protect your safety. No matter where you want to go, United Checker Cab is ready to take you there! Beautiful Torrance is a South Bay city with over a mile and half of beautiful beaches that are typically quieter and less tourist-y than those nearby such as Redondo Beach and Manhattan Beach. The lovely weather and beautiful views make this a favorite spot for locals and visitor alike. Torrance is home to the Del Amo Fashion Center, one of the largest malls in the United States, as well as a wonderful Cultural Arts Center that regularly features the best in music, drama and art. United Checker Cab can take you to all the exciting events in Torrance, no matter what time of year. At one time, San Pedro was an independent town well outside of the Los Angeles limits, but today this vibrant neighborhood has been incorporated by the larger city. However, it still retains a strong sense of its past as a fishing port, located on the lovely San Pedro Bay. The Cabrillo Marine Aquarium, the Point Fermin Lighthouse, the Korean Bell of Friendship and the USS Iowa are all favorite destinations for visitors to the area. San Pedro has become a favorite destination for locals as well, especially those seeking fresh seafood or simply enjoying a day at the bay. While you are here, let United Checker Cab take you to all the important San Pedro sites! Carson, California, is the home of the Los Angeles Galaxy, a major league soccer team, as well as one of the major campuses of California State University. Carson is also home to the StubHub Center, a large stadium used by the Galaxy, and the International Printing Museum. Visitors to the area enjoy the beautiful weather and a wide variety of shopping and dining experiences, including the SouthBay Pavilion, a large mall that features many popular stores and restaurants. With United Checker Cab, you can enjoy the best that Carson has to offer with fast, convenient transportation to any destination. Why Choose United Checker Cab? Call by phone. 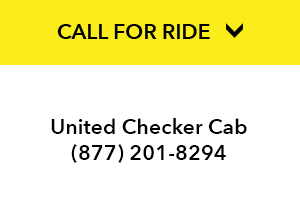 United Checker Cab offers convenient phone service with friendly dispatchers who can send a cab to you immediately. Call us at (877) 201-8294. Go online. By visiting our website, you can download the Curb app or simply order your cab with our convenient online form. You can also make an advance reservation for pickup at a later time. Contact us today to book your taxi ride! 2017-2018 © United Checker Cab. All rights reserved.